This Bobbin Cambridge Women’s road bike is in great condition. However, it has previously been ridden for a number of miles, and as such there is some wear on the drivetrain and tyres. Cosmetically, the bike also has some damage on the chain stay, the rear mudguard is also bent and dented but the tyre still runs cleanly. This year, Bobbin presents the exclusive official University of Cambridge bicycle range, produced in collaboration with the prestigious seat of learning. Inspired by the university's heritage and sophistication, all bikes feature the the iconic crest, logo and snappy Cambridge Blue detailing. Saddle up for a first class ride! 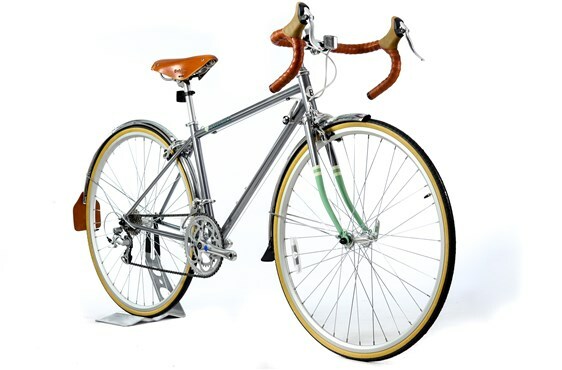 The Bobbin Cambridge Racer is a refined racing-tourer, perfect for speedy missions or simply for cruising across town. The Racer features a luxurious University of Cambridge leather saddle and matching honey-coloured soft leather handlebar tape. The slim tig-welded steel frame features urbane chrome paintwork with distinctive Cambridge Blue fork detailing. Matching chromed full mudguards with leather mudflap, gumwall tyres and 16-speed gears complete this gem of a bike.